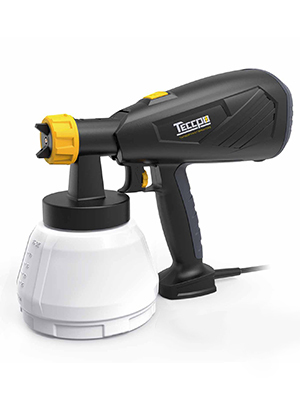 TECCPO TAPS02P electric paint sprayer is an indoor/outdoor hand-held sprayer kit for all projects. Perfect for the home owner, suitable for tables, chairs, bicycles, shutters, fences, wooden toys, models making and etc. ; Whether you're just painting the kitchen or an outside fence, Our Paint Sprayers can always help you get the job done fast,. ►1. Metal Valve Core: Sturdy and durable, no need to disassemble that makes it more convenient to use. ►2. 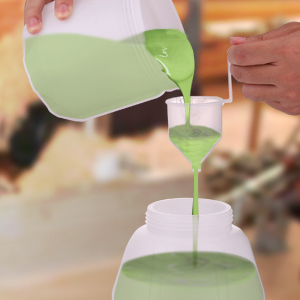 Larger Capacity: The 45-fluid ounce extra-large container enables you to spray larger projects without having to refill as often, saving your precious time. Works awesome both for home painting or industrial painting. ►3. Copper Cores: With good conductivity, it could reduce resistance and maintain a good working temperature and extend the motor life. ►4. Built-in Impeller: Perfect built-in impeller for better boosting of the fuselage. Water- and solvent-based paints, finishes, primers, 2-component paints, clear finishes, automotive finishes, staining sealers and wood sealer-preservatives. Wall paints (emulsion paints) etc., alkali and acidic paints. Coating materials with a fash point below 38°C. Sharpen your tool before achieving your project! 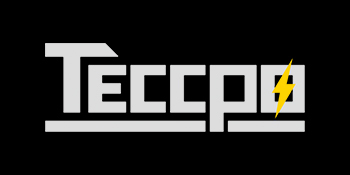 With understanding all your demands of a perfect project.We devote themselves to combining technology and power into tools to improve the quality of humans’ life. Perfect for the home owner, suitable for tables, chairs, bicycles, shutters, fences, wooden toys, models making and etc. ; Whether you're just painting the kitchen or an outside fence, Paint Sprayers can always help you get the job done fast. HVLP (High Volume Low Pressure) Technology gives you maximum control, air power technology to spray thin materials such as stains, sealers, urethanes, varnishes, and lacquers. 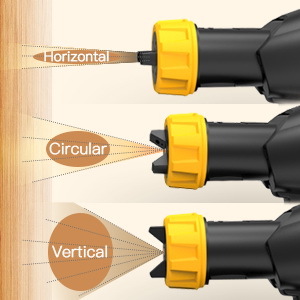 The spray gun can be adjusted to three different spray patterns: horizontal flat, vertical and circular jet. 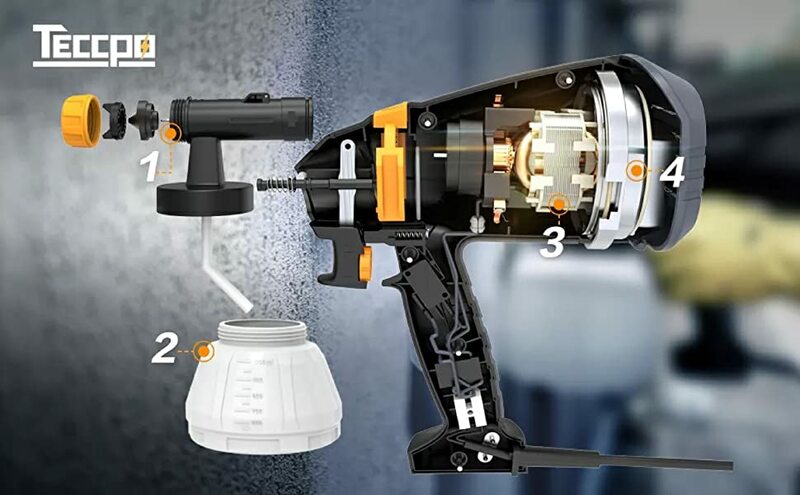 Simply rotating the spray tip to select either horizontal, vertical or round spray pattern, you can choose the fittest one based on your needs. 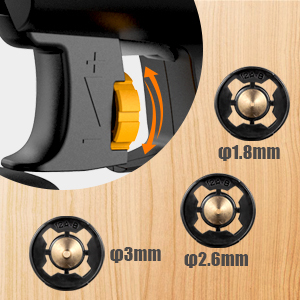 Packaged with three copper nozzles(1.8mm/2.6mm/3.0mm) instead of plastic, you can adjust the valve knob and control the flow rate for coating speed and project size for precise paint application, good to choose the fittest nozzle for different jobs. Equipped with professional funnel for thinning out the paint.No matter it is water based or oil based paint, If the paint could walk smoothly through the vescocity cup, it means that the paint is enough thin for the electric paint sprayer to spray it out. • After each use, clean the spray paint gun by running water with the attached brush. If using oil-based materials, cleaning pickup tube inlet with the cleaning solution.• Read all instructions and safety precautions before operating equipment. • If Dripping: Please check whether the nozzle/Tip collar is broken/ loose or not, whether thee Y-type seal ring of nozzle is broken or not.